Learn Something Local: Bottle Cutting and Wine Flights! Join us for the next Learn Something Local event with Amaro Winery and the Las Cruces Green Chamber, Sunday, October 15th from 2 to 4pm. 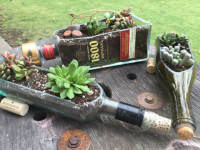 For $25, you will receive a hands-on workshop on how to make glass bottle planters, vases, AND glasses (from wine bottles)! PLUS, you will get a complimentary wine flight AND bamboo planter!